We are delighted to announce that we will be exhibiting at the Event Production Show at London’s Olympia on 1-2 March. The Event Production Show is the leading event for the UK’s live event sector. Visitors are made up of organisers of all sorts of events who are looking for innovative event solutions for their next event – something we, at XL Displays, can offer. We will be showcasing a variety of our products and members of our experienced sales team will be on hand to talk visitors through our product range and the services we offer, and be available to discuss what will work best for their exhibition needs. s well as offering a wide range of portable display equipment, such as pop ups and roller banners, we also provide a bespoke exhibition stand design service. For businesses looking for something a bit different to ‘wow’ their customers, we can design, print, manufacture and install a customised exhibition stand, in line with their brand and budget. At the Show our specialist sales advisers can provide advice on exhibition stand options. One of our talented graphic designers will also be in attendance and will have the facility to produce free exhibition stand designs and renders to give visitors an idea of what their stand could look like. We will also be demonstrating the X-GLOO, the ultimate event inflatable tent. This unique product is designed with the igloo shape in mind. 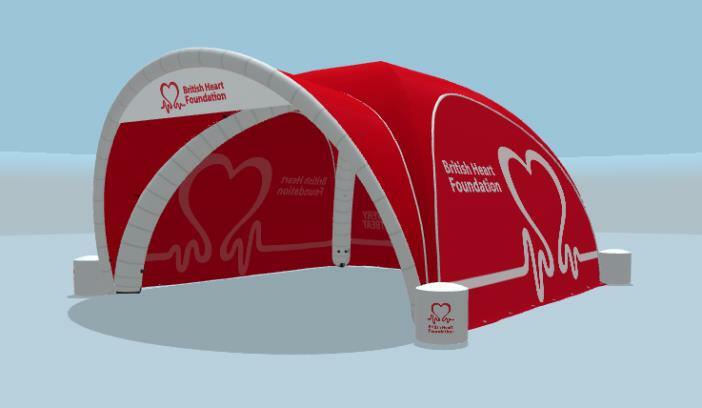 It offers endless customisation and branding potential and is ideal for businesses exhibiting at large scale events, either indoors or outdoors. As an official UK distributor of the X-GLOO, our experts will be on hand to talk visitors through the possibilities this high quality and versatile display can offer. The show is open from 9.30am-5.30pm and XL Displays can be found on stand B12E – please come and visit us for a chat and a cuppa!